You have to laugh when politics and religion get together. Otherwise it would be hard to stop crying. This is from The Sun in Malaysia today. 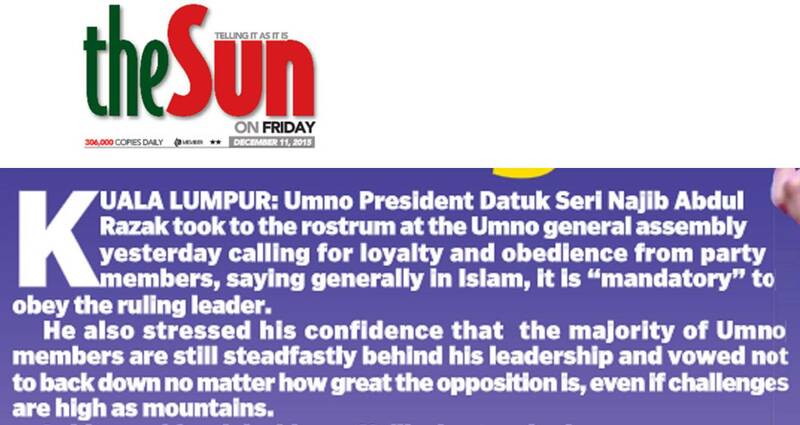 Of course Najib has been divinely appointed. Now if only St. Jeremy Corbyn could rely on a similar loyalty and obedience, it should not be too difficult to make Islam the State religion also in the UK. As Donald Trump points out that’s not too far away in any case. Of course the position of the Queen, who is anointed by a quite different divinity, might be a little uncertain. This entry was posted on December 11, 2015 at 2:55 pm and is filed under Malaysia, Trivia. You can follow any responses to this entry through the RSS 2.0 feed. Both comments and pings are currently closed.